THE MOST TRANSPARENT and COST EFFECTIVE car rental booking engine to hire a car in ISTANBUL ATATURK AIRPORT. Budget car rentals are offered in every rent a car class in ISTANBUL ATATURK AIRPORT - economy car rental, sedan or estate car, family minivan, 12-17 passengers minibus, adventure 4WD, cargo van or a couch. Our ISTANBUL ATATURK AIRPORT car rental fleet is built of reasonably priced cars for rent available at low rates starting from 7 EUR a day on all-inclusive basis - full insurance, unlimited mileage, second driver free on a single contract, pre-paid road taxes and everything else you may need with your car rental. Being long in the car hire customer service we know what you expect from us, and how to treat you. CAR RENTAL REVIEWS FOR ISTANBUL ATATURK AIRPORT! We value our returning car rental customers and reward them with great online discounts. If you book over 3 car rentals with us, you are entitled to a discount rent a car coupon. Don't forget to check our BULGARIA CAR RENTAL TIPS and to ask for our latest AIRPORT TAXI HIRE deals in Istanbul Ataturk Airport. As the largest city in Turkey, Istanbul prides itself with two international airports - Istanbul Ataturk airport and Sabiha Gokcen airport. Ataturk International Airport is Turkey′s major international airport, located on the European side of Istanbul. It is 23 km west of the city center and a hire car or a taxi into the heart of the cosmopolitan megalopolis of Istanbul is the quickest option as it takes around half an hour. Istanbul Ataturk International Airport is not only the gateway to the great city of Istanbul but also a major transportation hub offering flights to major cities in Europe, Middle East, North Africa, United States and Asia. Many of these are direct flights handled by more than 100 airlines, including charter ones. Considering the booming Turkish economy and tourism and the rapidly increasing both international and domestic passenger traffic, Istanbul Ataturk Airport is projected to be among the world′s top 40 in terms of total passenger traffic. Ataturk International Airport shares traffic with Sabiha Gokcen International Airport, situated on the Asian side of Istanbul, 40 km from the city center. It is Turkey′s newest international airport and is primarily used for a sub to Ataturk Airport. Sabiha Gokcen Airport is mainly served by domestic flights and budget charter air companies such as Easy Jet, German Wings, Condor, MyAir, Corendon and Air Arabia. With the increasing flow of world travellers from Bulgaria to Turkey and from Turkey to Bulgaria, booking competitive and reliable car hire at Istanbul Airport has become more in demand. Motoroads is in the unique position to be able to offer its customers not only the most competitive deals at all major Bulgarian airports but the most reliable car hire service at Istanbul International airports as well. 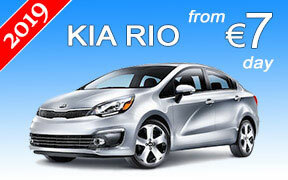 Istanbul Airport car hire is surely a great addition to any holiday in Turkey. So go ahead and discover the delights of Istanbul with exclusive Istanbul Airport car hire deals from motoroads.com. With our Istanbul Airport car hire deals you can have a complete flexibility to explore this great city and the surrounding area. Save time and book your Istanbul Airport car hire with Motoroads by checking the range of vehicles online below as this will ensure you will get the most of your time in Istanbul. ISTANBUL ATATURK AIRPORT CAR RENTAL » WHY MOTOROADS ? What you see is what you pay! We don't apply any hidden charges online or at our Istanbul Ataturk Airport car rental desk. Your Istanbul Ataturk Airport car rental booking is processed online instantly on a secure server. We require only a small amount to be paid in advance to secure the booking and the balance is due upon car collection in Istanbul Ataturk Airport. We apply the most fair fuel policy FULL-FULL for all Istanbul Ataturk Airport car rentals. You will get your rental car with full tank in Istanbul Ataturk Airport and have to return it full. Some exceptions may apply for busy rental periods. Our Istanbul Ataturk Airport car rental rates include full insurance - Third party liability coverage, CDW (Collision damage waiver), VTW (Vehicle Theft Waiver) and no excess. All Istanbul Ataturk Airport car rentals have unlimited mileage. The second driver on your Istanbul Ataturk Airport car rental contract is free of charge. We do not charge any additional fees for winterization (winter tires) online or at our Istanbul Ataturk Airport car rental desk. All cars are equipped with proper seasonal tires. You can change your booking free of charge up to 24 hours prior to car collection in Istanbul Ataturk Airport. It is subject to availability for the new car rental period.